Fire show at the wedding! Well, if you like it hot and you like hot rhythms of Latin music, we have a wedding fire show “Hot Love” in stock! 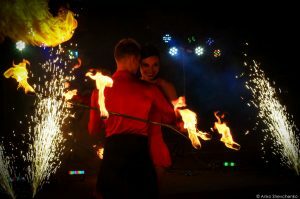 This bright, groovy fire show with this story, was created specifically for young couples who want something fun and they had no idea what to expect. In our fiery theater work real professionals, who easily took the bar Latin dances. 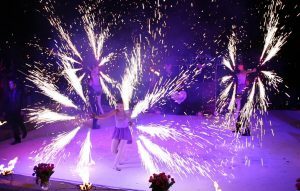 To do this, fire show, our decorators have created an exclusive and original details, such as the rose of fire, which the protagonist fire show presents his sweetheart at the meeting. For the wedding is very symbolic and incredibly romantic. 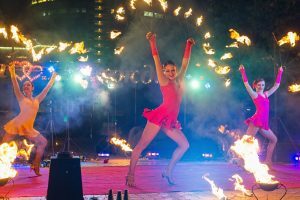 The wedding fire show “Hot Love” artists perform complex acrobatic pair of elements that do not make athletes Latin dance on the dance floor. We love to surprise its audience and that we succeed! Also, our choreographer can help you create a wedding dance. 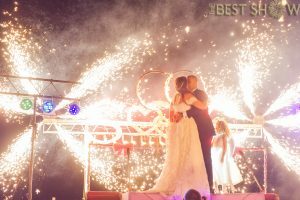 A pyrotechnic designer you arrange your first wedding dance. After all, we all want to this point was not only in the memory, but was captured by photographers and videographers, and to turn the dance into a real fairy tale, Bestshow team will gladly help. 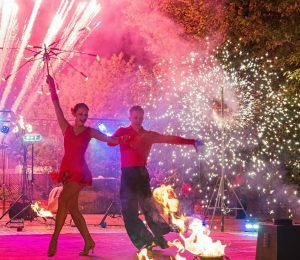 Imagine a beautiful gentle music begins, the couple approach each other, begin to dance, and for example, the chorus or on special choreographic steps, included pyrotechnic fountains that decorate the stage or dance floor, where the couple dancing. Against the background of such beauty, leaving only the most magical and romantic pictures. In the room we use only cold pyrotechnics, smoke-free and practically odorless, it is safe for all guests and young people who arein close proximity. Firework fountains are of different heights and different colors. It all depends on the possibility of space and taste of the bride and groom. 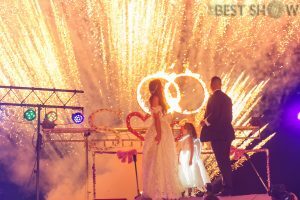 In addition, we recommend cold pyrotechnics decorate your wedding dance special effects such as severe smoke, confetti. And if you want to visit grinned umileniya- we will arrange your dance young dancers, angels. Well, a celebration in full swing, or is already coming to an end and it’s time for a wedding fire show! This can be a great wedding gift or a luxurious completion, and with that and with our other fire theater cope perfectly well. Your application is accepted. Our manager will contact you within 30 minutes.